The workers awaiting immigration reform need the ability to work legally, but they also need to be empowered at work. This weekend, President Obama again pushed away the issue of immigration. Despite growing pressure to take executive action to curtail deportations, Obama again swept the lives of millions of immigrants off this fall’s agenda—enraging advocacy groups by heeding his party’s fears of angering right-wing voters before key mid-term elections. But while politicians dismiss immigration as a third rail, they cruelly ignore the fact that another major election issue, the economic woes plaguing workers, is also an immigration issue. With Congress paralyzed on immigration reform, Obama has mulled taking some form of executive action to provide deportation relief and work authorization for the undocumented. Obama has already created a template for such a move with the Deferred Action for Childhood Arrivals program, issued two years ago to provide temporary protection from deportation to undocumented students and military members. There’s a basic moral imperative to expand the deportation reprieve to the older family members of the youth who qualify for Deferred Action. Right-wingers will no doubt stoke fears that the country will be overrun by hordes of cheap labor. But racist canards about “border security” mask the real injustice at stake. In order for any worker to be fully empowered and protected at work, labor and immigration policy must ensure equal rights across the workforce, including—and especially—the immigrants working the most exploitative jobs. But aside from the economic rationale for executive action, the government has, at the bare minimum, an ethical obligation to keep embattled immigrant families intact, by providing relief, at least temporarily, from the threat of forced exile. You can’t calculate the social opportunity cost of living under the terror of detention and deportation. 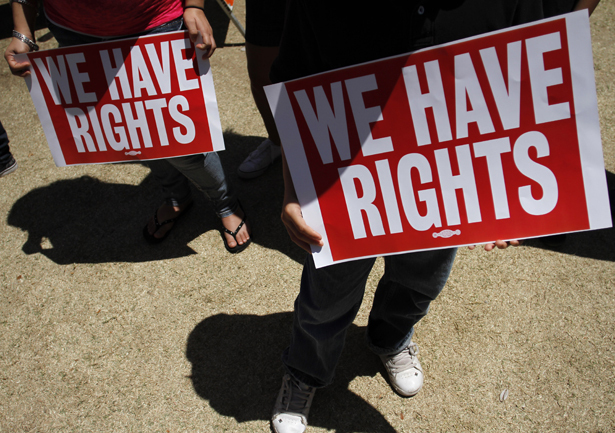 Since demonizing and marginalizing the undocumented only keeps the workforce segregated, all workers are hurt when employers can skirt responsibility for egregious violations of workers’ rights. And the whole workforce benefits from ensuring that everyone, with or without papers, has an equal right to justice against abuse and discrimination. Research on low-wage workers in Los Angeles by the University of California–Los Angeles Labor Center reveals that while immigration is linked to precarious labor, the problem is systemic. And the responsibility lies with employers and policymakers. A study on California’s construction industry, published by the think tank Economic Roundtable (ERT) with support from the United Brotherhood of Carpenters, analyzes a complex system of informal, precarious work that destabilizes every rung of the labor structure—documented, undocumented and native-born alike. According to researchers Yvonne Yen Liu (a former colleague of the author’s at Colorlines.com), Daniel Flaming and Patrick Burns, informal employment has increased four-fold in California’s construction industry since 1972. Informal workers—those working “off the books” or misclassified as independent contractors rather than formal employees—now constitute about one-sixth of the workforce. Their marginal jobs enable firms to avoid taxes and insurance costs and escape regulatory oversight. Contrary to stereotypes, the problem is not cheap labor “stealing Americans’ jobs.” It is massive corporate theft, and everyone pays for it. In 2011 alone, “[t]he federal government lost $301 million in taxes.… California lost a total of $473 million, including $264 million for workers’ compensation, $146 million for state disability, and $63 million for state unemployment insurance.” Overall, informal construction workers make just 50 or 60 percent what their formal counterparts earn. The households informal workers support are three times more likely to suffer from poverty. I couldn’t work, because I couldn’t walk. I felt like I had legs made of rubber, with no muscle, but they made me work for a month after my surgery. They said you have to show up or you’ll get fired. They threatened me. Perez was later fired, but because his job had been misreported, he was owed more than $100,000 in unpaid wages, according to the study. Anemic enforcement of wage laws has left many workers like him stuck in a perpetual labor underclass. UCLA Labor Center’s research shows that even workers who file formal complaints are often unable to recover lost wages. The prevalence of informal labor is another reason why work authorization alone wouldn’t fully protect low-wage immigrant workers. Although deportation relief would help struggling workers stabilize, to achieve full equity the undocumented need a fully inclusive labor structure. A racially and socially stratrified workforce ensures that many will remain stuck in poverty-wage jobs and vulnerable to abuse. That’s why unions are calling for administrative relief that is not conditioned on a worker’s employment. This way, immigrants who are unemployed or working irregular and casual jobs, such as domestic workers and day laborers, are not further penalized for their precarious economic situation. A more proactive approach, for example, would be enacting and fully enforcing a comprehensive anti-wage theft law. Or in construction work, instituting a fair floor wage industry-wide, regardless of immigration or employment status. According to the ERT, paying informal and formal workers on an equal wage scale would yield $1.5 billion in economic stimulus, and in turn generate 9,500 new jobs. When a subset of any labor force is deterred from organizing by the risk of being fired or deported, the boss wins and all workers lose. (This is a tried-and-true tactic that corporations have used to retaliate against immigrant workers who organize or raise grievances). So legal relief is key, but only if it opens up the door to empowerment. The workers awaiting immigration reform need the ability to work legally, but they also need to be empowered at work. Maybe Washington fears immigration reform not only because it might damage their electoral prospects but because it might set in motion a process of social reckoning. Just imagine if the country’s most dispossessed workers finally got a chance to stand up and lay claim to what they’re owed. Instead of seeing the law as a force of oppression, they’d wield it as a tool for seeking justice.